How to make it seem a normal week when you know the achievement would be abnormal? Rory McIlroy will try to master the Augusta trick once again as, for the fourth year in a row, the prospect of joining an immortal quintet lures him towards the Butler Cabin. Intriguingly, only Gene Sarazen completed his career Grand Slam at the Georgia featurepiece. That was in 1935 when the Masters was only in its second year. The "Majors" were still to be defined as such; as they were yet to be in 1951 when the Masters became the third of the big four on Ben Hogan's resume. Otherwise, Jack Nicklaus and Gary Player won their second Majors at Augusta and Tiger Woods his first. Could this make it more difficult? McIlroy understands the argument. "I suppose, because there have been eight months between the USPGA and the Masters, rather than just a month between the other three. 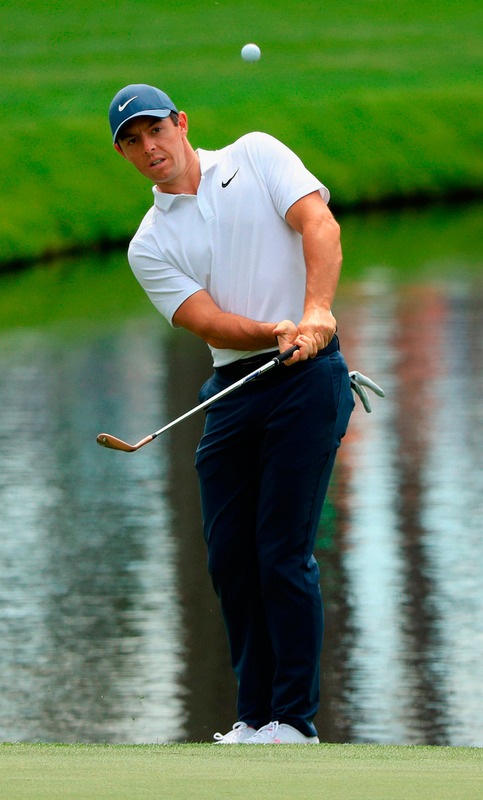 "You've got longer to wait and more time to build it up in your head," McIlroy (above) said. "And the Masters does have that mystique of going back to the same place. But all the Majors take some winning and you can't hide behind that. It's my job to go there and do what it takes. That is why the career Grand Slam is so difficult." In truth, McIlroy found the Masters hype a burden before he came within one win of the exclusive club at the Open in 2014. "I remember in 2012 and how pumped I was going to Augusta after what had happened there in 2011 (when he shot an 80 in the final round after leading by four)," he said. "I'd won the US Open straight afterwards, but I still couldn't wait to get back to Augusta to try to rectify things. You can't be like that, well I can't anyway. "It's about going out and just playing golf and not making it out to be more than golf. I think I finished 40th." The next year he finished 25th and there followed four top-10 finishes, with fourth in 2015 being his best finish so far. "I've been getting better there, without really contending," he said. "I haven't been in the mix really since 2011 and, although the last round was clearly a nightmare, I not only learnt the lessons, but also took the positives at getting myself into such a strong position after three rounds at 21 years of age." Now, 28, the Augusta positives are racking up for McIlroy, perhaps more tantalisingly than ever. Only once before has he come into the season's first Major with a PGA Tour win already to his name, and that was in 2012 when he arrived too gung-ho. And it was not just that he finally broke his 18-month drought and prevailed at last month's Arnold Palmer Invitational that highlighted his candidacy, but the manner in which he triumphed. When his stunning 64 left behind a chasing pack including the likes of Justin Rose, Henrik Stenson and a certain Tiger Woods, one of the favourite lines trotted out about the Ulsterman filled social media - "Rory's best is better than anyone's". With the exception of Woods, of course, in his pomp, McIlroy tends to agree, especially when he compares himself against this generation. "Yeah, I feel that - if I'm on my game, if I get on a roll and if I'm playing with them as well, because that helps," he said. "That hasn't always been me. I struggled with it the first few years, when I was under pressure, but now, I think that's when I play at my best. Once I get myself a sniff, I like to be in that position. It's just getting there more often." For the first time he will be teeing it up at the Masters as a married man and will also have a new bagman. McIlroy has only ever known JP Fitzgerald as his caddie at Augusta before. While Erica Stoll has, of course, been so important to his happiness off the course, Harry Diamond has made him smile almost just as much on it. Diamond, McIlroy's best man, was meant to be only a temporary replacement after Fitzgerald's sudden dismissal last July, with the experts telling McIlroy he needed a strong character to sort out his "course management". Initially, McIlroy agreed, before choosing his own way. "A few established caddies were going to come down to Florida in the close season and I was going to spend a few days with them, but I sat back and thought 'what's the point? I'm enjoying it with Harry'," McIlroy said. "Harry's really grown into the role, he's got his book and is doing his thing but, for the first time, I've now got my own book, with my yardages and all that. I like that." It is the mindset he requires at Augusta. "It's easy to get down on yourself there," McIlroy said. "I've proved that before. You've got to know when to attack and defend. This is my 10th Masters. I should be getting the hang of it."